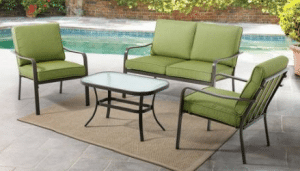 When looking for a cheap conversation patio furniture set, this Mainstays Stanton set from Walmart.com will be something to compare with other options. I have information on several other sets here. 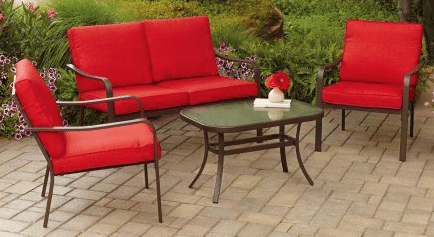 This set has a dark brown powder coated steel frame, four color choices for cushions and a tempered glass with a pebble top design. The best thing about this set is the simple design, low price and free pickup at any Walmart store.Set up by the pool or any medium, 8 foot square or larger outdoor space. No other sets or pieces are available for this set. Now lets look at the details and see if this set has what you are looking for. You will get two straight leg chairs, a two person love seat and a tempered glass top coffee table. Your conversation set cushions will be available in four colors green, red, tan and brown. The frames are a powder coated steel material finished in a very dark brown, almost black. The chairs are 29.5 inches deep, 24.25 inches wide and 28 inches high. Each chair will support 250 pounds. The backs of the seating items have a steel bar for support, the seat have a poly fabric to support the seat cushions. The love seat is the same size as chairs just double wide at 45.5 inches. It will support two butts at 500 pounds. The coffee table is 32 inches long, 20 inches wide and 18 inches tall. The top has a built in glass insert. No hole in this table for an umbrella, table is just too small any way. 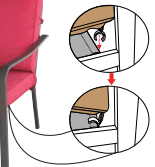 Seat cushions have clips to hold to the frame, the cushions can be reversed when needed. The cushions are made from a polyester material. The seat cushions are 22 inches deep, 21 inches wide and 3 inches thick. The back cushions are 17 inches deep, 21 inches wide and 3 inches thick. Covers for cushions have zippers to remove for cleaning. I still recommend storage for cushions when not needed to extend their outdoor life, see some of my storage solutions here. Your set will arrive in one box. Assembly of the table will take having the top upside down on a solid surface. Add four legs to the corners, then add the center support. Set up on legs for final tightening of screws so that you table will sit level. The chair seat will attach to the back assembly. The arms/front leg assembly will be added next. Add cushions and you are ready to sit. This set can be assembled in about an hour with two people and some skills. When looking for inexpensive metal conversation patio furniture, the Mainstays Stanton set will work very well. For a price of under $250, the choice of four cushion fabric colors and easy assembly, you will be hard pressed to find a better set for the price. Keep the cushions in some kind of storage when not in use and this set will last several years. I like that this set has a simple design that will go with almost any outdoor decor. It will fit in any area that is at least 8 foot square or larger. You can place by the pool or in a garden area, this set will look good in any location without any changes. If you liked this information and found it useful, please share with your friends on your social networks. If you have any questions or comments, please use the forms below, I will get back to you shortly. 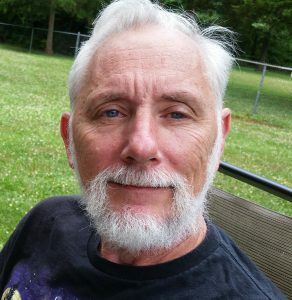 There are some affiliate links in this article, if you use them I may make a small commission. This is a seriously great price for this set! It is more than adequate for a garden area. The fact that it is steel eliminates any concern for the lower price factor. I can picture these pieces on an apartment or condo patio area too. This set will look great in any small space in your patio or yard area. The powder coated steel frames will be very durable in outdoor conditions. Very nice set. I will keep this in mind, thank you. We live in Texas so getting outside to relax is essential for dealing with the heat. It will soon be triple digit temperatures and this would really help. Thank you. This will be a great set to sit outside in the Texas heat under some kind of cover. Shade would be very important to me if I was in Texas. I think this is a really great patio set for the price. The powder coating makes a great looking finish. Hard to find for the price. Great inexpensive set for your patio area. Thanks for this simple yet to the point article John, I like the fact that this Mainstays Stanton Conversation set is available at such a good price and conveniently at Wallmart. The con’s on this item signify to me that this set needs to be treated with TLC otherwise it won’t last too many seasons. Point to consider. The cheaper items sometimes do not last as long. If you take care of the cushions in this patio set, it will last quite a few seasons. 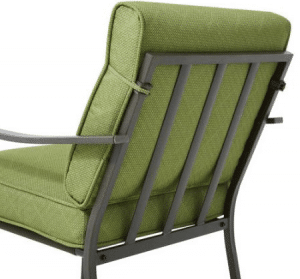 How you take care of your patio furniture will determine how long they last. This set does come with a green colored cushion. This is a very affordable set that will take the weather very well, still need to store cushions when not needed.